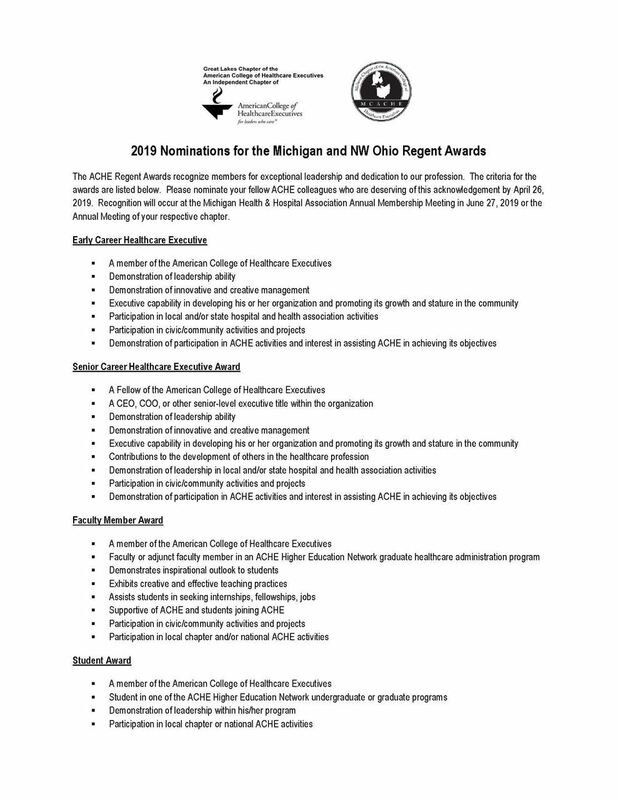 for healthcare leaders in Western, Northern and Central Michigan. Independent Chapter of the American College of Healthcare Executives "For Leaders Who Care"
The Great Lakes Chapter was historically known as the West Michigan Healthcare Executives Group (WMHEG), which was established in 1988, with approximately 50 members. In March 2004, WMHEG was revitalized as a chapter of the American College of Healthcare Executives (ACHE), based in Chicago. Also in 2004, ACHE affiliates in the Central and Northern portions of Michigan agreed to combine efforts as The Great Lakes Chapter. Current chapter membership includes professionals working in a variety of settings, including hospitals, health plans, medical practices, consulting firms, pharmaceutical companies, nursing homes, universities, and other areas of the healthcare industry. Leadership for the organization is provided through an advisory board with representatives from the Western, Northern and Central regions of Michigan. We are pleased to serve the Great Lakes Chapter members. Please do not hesitate to contact us with your comments and suggestions. Sept 25 or 26: Repeat Panel at MHA Patient Safety Conference at Troy Marriott?